I’m not a fashion blogger by any means (and I never will be!) but in the last 6 months or so I’ve started to pay much more attention to the clothes I wear and what’s in my closet. I have always been pretty low-maintenance when it comes to my wardrobe. I keep clothes until they practically fall apart and I do 95% of my shopping at Target and Old Navy. But, up until recently, I’ve not been very thoughtful about the clothes in my closet. I have entirely too many of those “stand in front of my closet full of clothes and complain about having nothing to wear” kind of days, and I have entirely too many pieces in my closet that I rarely wear. Over the last few months, I’ve become intrigued by the idea of a capsule wardrobe. I’ve been following Un-Fancy for a while now and have searched “capsule wardrobe” on Pinterest more times than I can count. At first, I was staunchly against the idea of actually doing one myself – it’s a scary concept, really. But, the more I thought about it and the more I researched it, the more I wanted to just jump in. My motto for this year has been “be content” – I’ve been working to find contentment and peace in every area of my life, but specifically with all of the “stuff” I have. I’m constantly yearning for more, and I don’t need it. I have all that I need (and then some!) and I’ve been working towards reducing my constant desire for more, more, more. This new challenge (and trust me, it’s a challenge!) lines perfectly with my goals for contentment, and I think that by reducing my wardrobe to only the necessities, I’m going to find that I have so many more options and am so much happier with what’s actually in there. So, what’s my plan? – My first capsule will be for the fall and will span September-November. I’ll probably go ahead and officially “start” with it when I go back to work in mid-August, though. – I’m reducing my wardrobe to 50-ish pieces. I’m not 100% decided on the number yet, and I’m not done cleaning out my closet yet. 50 sounds like too many to me (it feels too comfortable, and like I wouldn’t be pushing myself enough), so I’ll probably try to go lower. I’m undecided – I love the Un-Fancy model of 37 pieces, but I don’t know if I can get that low! – My capsule will for sure include shirts, bottoms, jackets/cardigans, and dresses. I think I’ll also include shoes, but I’m not fully decided yet. – My capsule will not include accessories, workout clothes, pajamas, or school/college t-shirts that I occasionally wear for work (though I am limiting myself on how many of those I can keep in my closet). – I will not shop for clothing at all for the duration of my fall capsule. If I need to add anything for the winter, I can do some shopping as I’m putting it together. – I’m not actually donating or getting rid of anything yet. As of now, I have all of my extra clothes in a giant pile on the bed in our guest room. I’m trying to leave things very open to myself just in case I have an “I have to wear that specific shirt moment,” but I doubt that will happen. I did this phase one section at a time (short sleeved shirts, then tank tops, then long sleeved shirts, etc.). I took every single piece from that section out of the closet and laid it on the bed. Then, I made piles. Pile one: I feel fantastic in this and could wear it ever day. Must-have in my capsule. Pile two: I like this a lot, but I’m not positive I have to have it. May or may not end up in my capsule. Pile three: I definitely don’t want this in my fall capsule. The first pile was the smallest by far, and the second and third piles generally ended up with similar numbers of items in them. I didn’t think too hard about this phase – I went with my gut. 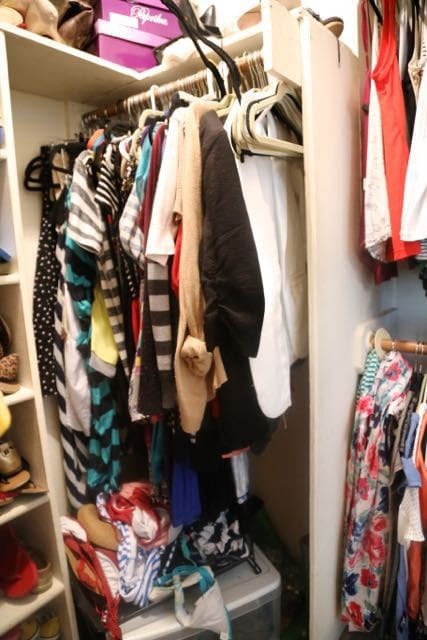 Once I had sorted it into piles, I put away the things I knew I wasn’t using, put the rest back into my closet (I put a few empty hangers in-between the “must haves” and the “maybes”), and then I walked away. Yes. I walked away, I stopped working, I didn’t think about it anymore. I still have a long ways to go – there are way more than 50 pieces left in here. But this is a major start. July isn’t even over and I don’t go back to work until the end of August, so I still have about another month to continue editing and work towards my magic number, whatever that will be. I’m planning on starting “Phase Two” soon, which will be to go through a second time and do the same thing – with a more critical eye. The second time around, I’ll put more thought into my choices, I’ll be more brutal, and I’ll be focused on eliminating as much as possible. Then, of course, “Phase Three” will be to settle on my final capsule! I’m so excited about getting start with this, and I can’t wait to see how it all goes. Anyone else join the capsule wardrobe movement lately? I’m Inspired! 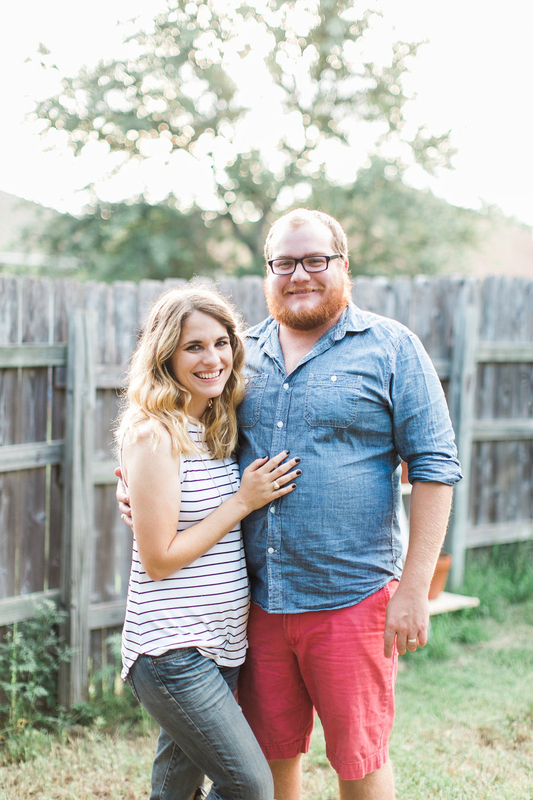 I’ve been needing to do a complete clothes overhaul since I had my baby almost 2 years ago and I’m going to try this…. I started poking around on Unfancy and I have a few unanswered questions/thoughts? How often does one do laundry when you have a capsule wardrobe? With only 3-4 shirts in a capsule it seems impossible to make it a whole week without washing clothes. I haven’t totally settled on my wardrobe yet, but it’s looking like I’ll have at least 10-15 tops in my wardrobe, so I don’t think laundry will be an issue. I am going for a slightly bigger capsule (some people do just 15 or so items!) but with a larger capsule (most I’ve seen are between 37 & 50 pieces), it shouldn’t be too hard to have enough to get through a week without laundry! I’ve also read a lot of blogs lately that have said that doing a capsule wardrobe really taught them that their clothes don’t need to be washed after every single wear. Unless you get something on your top or get sweaty, it may make it through 2-3 wears before actually needing to be washed. As far as people seeing you in the same clothes all the time, I’m actually interested to find the answer to this out myself. 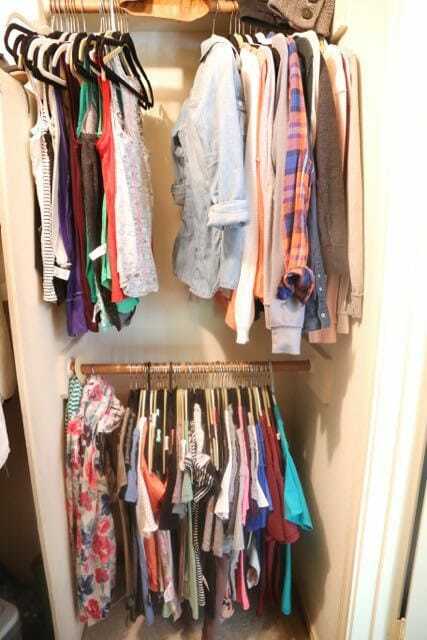 One thing I’m really working on in putting together my capsule (and I think this is common with capsule wardrobes) is that I’m trying to make sure that everything in my closet will “go” with at least 3 other things in my closet. So each top should be able to be worn with at least three different bottoms (and vice versa). I’m thinking that with a smaller wardrobe I’ll be forced to stretch my creativity and try out new combinations/accessories that will make the outfits look different from one another. I’m thinking about taking photos of the outfits I put together (just for myself to refer to for ideas) so if there’s any interest in sharing them here as I go to show how versatile a small wardrobe can be, I might do that! I did a mini capsule in May to test the waters. I then switched to my summer capsule in June. I’ll tell you that the part you’re doing now is the hard part. 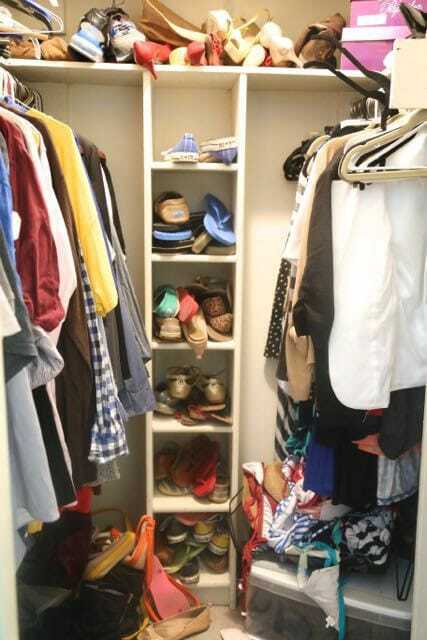 Switching from season to season is easy (get rid of what you no longer need, see how many empty hangers you have, go “shopping” in your clothes bins). Good luck!